How to create a quality email newsletter - Blog XMailer. To send Your letters to any number of addresses, it is important to follow some the rules that we developed together with our users in a long time use XMailer as the program for distribution. In General, the rules and recommendations allow you to send your emails consistently with using free smtp servers popular email services. XMailer does not require installation on Your computer, because you can run it on any device running on the Windows platform. 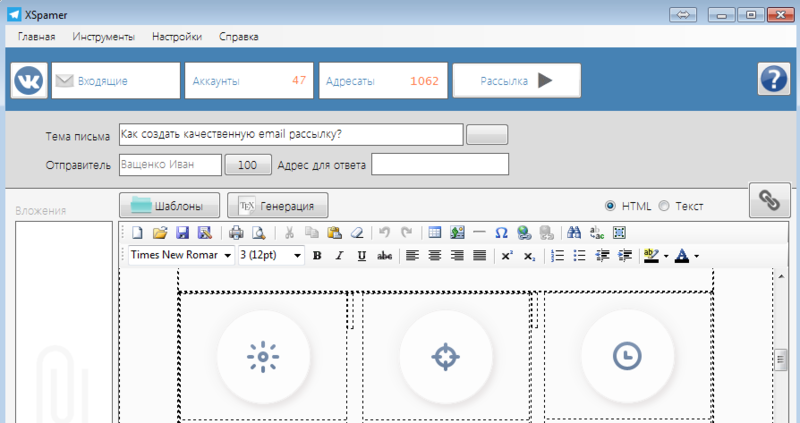 Download from our website Net Framework 4.0 and install it. Disable all antivirus apps and try to run the program again. Contact technical support, we have You covered. It is also possible download from our base of recipients directly in the program or sparsit from any file using the respective menu item in окне Recipients. Before launch, we recommend you to run a tool that checks Your database for validity. As reactogennosti base of recipients, serious signal for spam filters spam mail. Keep Your database up to date. The program XMailer2 can send messages from any SMTP servers that support the connection of any email clients (Outlook Express, The Bat, Mozilla Thunderbird, PegasusMail, etc.). The easiest and proven way to distribute is to create a new mailbox on the server NGS.RU or MAIL.RU (just register 10-15 boxes NGS.RU or MAIL.RU). Address boxes (login) should choose the same serial numbers on the end. (for example: [email protected], [email protected], [email protected], [email protected]). Password when you register, also specified the same for all boxes. Если вы не желаете тратить время на регистрацию новых почтовых ящиков, вы можете их download из нашей базы аккаунтов. Подробнее об этой возможности написано here. The newsletter can be done in the form of a normal text message (with active links) or in the form of pictures .jpg. Or combination options. The picture is often better perceived visually, looks more solid and send it easier! The program incorporates a unique algorithm of constant change images (name, size, divide into pieces), which allows you to send pictures in large quantities (tens of thousands). If you are going to send out over 100 letters make several topics messages! Right click button to edit the list so with each new line, write a new topic (the more the, the better it will prohodit newsletter!) To send 10,000 messages per 10 hours, about 80 topics. Matters are different in the case of: "Sell the boots cheap!" and "Cheap sell boots!" But it is best to create a lot of topics and as much as possible to use synonyms (i.e. different words), not the root. If the content of the topic for You it doesn't matter but important is the uniqueness, then you can nagraviroval how pleasing a number of different topics on any topic with the help of our generator text built-in XMailer 3.0. 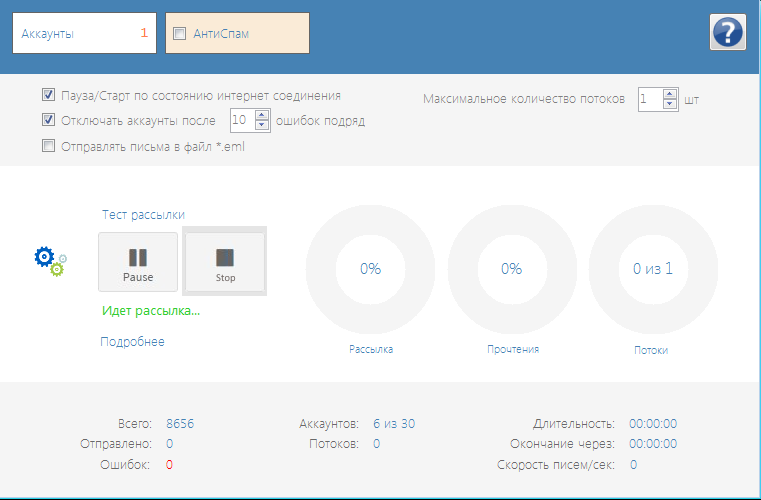 In the field "From whom" by clicking the box to the right of the field to add about 10-15 different "versions" of the name of Your company, for example: "LLC ALTAIR", "AL", "FIRM ALTAIR", ORGANIZATION is "ALTAIR", "ALTAIR" Novosibirsk and others. You can write the name and patronymic of Your employees etc. It is also possible to use name generator sender. If left blank, then the box for answers will be the outbound box/I. In this case the response letter will be sent to the mailbox from which the message was sent. It is better to use the second option to have multiple mailboxes that will receive the response letter (this is done for additional bypass spam filters, as in the case of specifying one drawer can lock the sending of Spam). When all the required fields in the program are filled in correctly, the button is active "Newsletter"now you can move on to the next step directly in the window list! Also, be sure to put the check box "Automatically disable accounts after incorrect 10 mistakes in a row. In this case, the program will automatically disable the boxes because 10 errors in a row can be only in case of contact emails in SPAM, lack of Internet or lock your boxes. Галочка "Control readings" дает возможность просматривать статистику прочтений Вашей рассылки, но пользуйтесь этой функцией с осторожностью, так как адрес сервера, который собирает информацию о прочтении Ваших писем, может быть сигналом для спамфильтров о нежелательной рассылке. Сейчас мы разрабатываем механизм обхода этого ограничения и к 2016 году должны запустить это решение. When sending pictures in a large volume, it is also reasonable to set the division of the image into pieces ("Min.pieces and Max.pieces"). This feature in the program enables the division of the picture into several small images before sending (recipient sees the picture as one holistic). And this happens every time completely randomly (vertically and horizontally), and each picture is assigned a randomly generated name (which is unseen by the recipient). If, for example, put number "Min.pieces" - 1 "Max.pieces" is 3, then the division of the picture in this case will take place from 2 to 4 small images. - In the field "Change" is set in % of the change in the direction of increase and decrease of the sent pictures. The change allows for the addition of give uniqueness to each sent email, and more successfully carry out the distribution without significant loss of quality. When setting changes by more than 20% please note that when reducing the small pictures, the text may be badly readable. Best is change by 10-15%, and the text in the letter small it is better not to do! Once the program is ready to work need to go test mailing to send a test message. If there is a notice "Failure sending email. mail", check the connection to the Internet block 25 port by antivirus or firewalls. If there is any other error message, check the spelling of data in the sending account (login, password). And use checking account to the health. Here are some of the main points that must be considered, if You need a quality newsletter! The fresher the boxes for mailing, the less likely splashes in SPAM. Newsletter better to do at night, because at night in a minimum volume received SPAM complaints from recipients.